On Friday 8th of February a red mini traveller was noticed by several people parked in High Street Mow Cop, just in front of the Castle. It was a cold frosty night so little time or attention was paid to the vehicle even though the lights were still on. 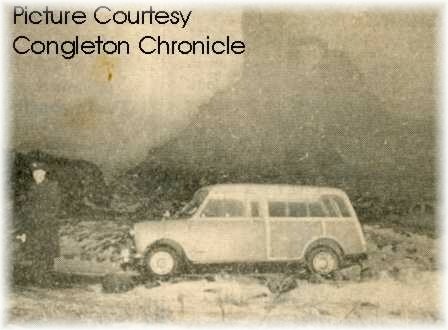 The windows were frosted over and cars were often left broken down or abandoned in the cold. On the Saturday morning a bus driver, Mr. Reuben Austin became curious, and investigated with a torch. He discovered in the back seat of the car the dead body of Mrs. Mary Elizabeth Walton aged 52. The suspect later convicted of the murder was Mrs. Gwen Massey, a Sunday school teacher and choir soloist from Rudyard. Miss Massey had been having an affair with Mr. Frank Walton, which ended in October of 1962 when his wife had found out. During the subsequent court case, which began in May 1963 the court, heard how Miss Massey had somehow tricked Mrs Walton, the only person that stood between her and happiness with her lover Frank Walton, to a meeting at the Plough Hotel in Endon. While there Miss Massey attacked her victim with a brick hammer and hit her skull at least eight times. Miss Massey then put the still live but unconscious body of Mrs. Walton in the back of the Mini Traveller and drove to Mow Cop where she abandoned it. Miss Massey then walked the 11 miles home, in order to escape responsibility. The case had been backed up with bloodstain forensic evidence, and several witnesses saw Miss Massey walk home on that cold night. On Wednesday 29th May 1963 after just 1¼ hour the jury returned a verdict of guilty. Miss Massey was sentenced to life imprisonment. The Judge John Ashworth said it was "The only possible sentence."